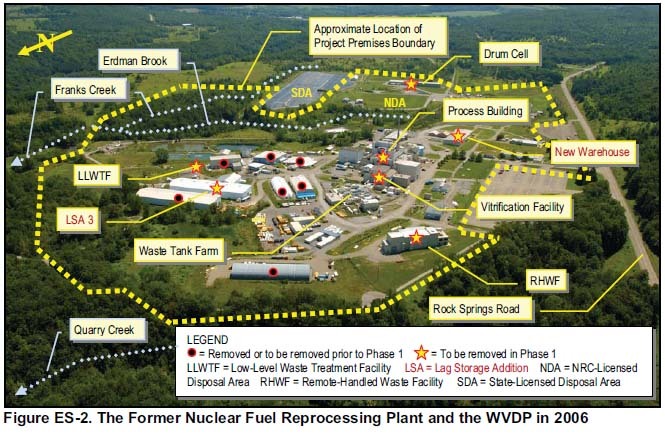 Image from Decommissioning Plan showing WVDP bounds and facilities to be removed prior to or in Phase 1 decommissioning. Test fitting an overpack, which will hold five high-level waste canisters, into a vertical storage cask. On the left the Main Process Plant, Vitrification Facility, Remote Handled Waste Facility, Waste Tank Farm and Other Structures. To the right the State-Licensed Disposal Area with dark cover and the NRC-Licensed Disposal Area which has since received a geomembrane cover. Main Plant Process Building and associated structures. During Phase 1 decommissioning, 275 vitrified high-level waste canisters will be moved to the interim storage pad and the building will be removed. This site provides information and materials on the work of The West Valley Citizen Task Force, a 19-member advisory group which has been meeting since January 1997. The Citizen Task Force process is being conducted in addition to the public comment processes required by the National Environmental Policy Act and the State Environmental Quality Review Act. Review the schedule of meetings for the year, find meeting summaries and materials distributed at each CTF meeting. Information for 2019 meetings will be added as it becomes available.